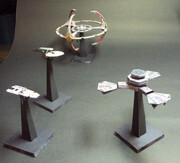 I made some Star ship miniatures for the tactical spaceship combat of a Star Trek RPG I'm playing. Most of them are just top-views and bottom views of ships (some direct from the blogs of the designer, like Doug Drexler) aligned so that I can cut and lighly bend them to give a 2.5D feel to them. I'will put the print version of them in the next few posts. These really rock! Thanks so much! 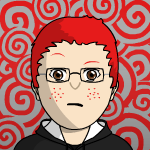 I really should put the ships I've done up on here sometime. I've gone through a few iterations of 2d/2.5d ships, but for the moment I'm just doing this to the flat ones to fold/glue and slide into the slotted bases I have available. You end up with the a white tab coming down at a 90 degree angle from the bottom of the ship. I was never quite happy with the way they were turning out, but it was an improvement over the tokens we were using before. Some of them looks like you cut the shapes before folding and gluing the two sides... am i right? Because of the weird shapes and the 2.5D, some of the parts were getting pretty thick after it was folded and glued, so I tried cutting them beforehand and struggling with lining everything up. I feel like I got pretty close to what I wanted, but something still isn't quite right. Your "JJ" Enterprise is perfect. This'll help me build some of the twin-naceles ships that I was finding difficult to manage on paper. First cut out the strips to make the circular warp halos, only then fold and glue the parts of the ships at the line. Fold the halo strips in half and make little circles with them. Edge the Suurok Class halo (the upper one) light blue. Align and glue the two sides of the photo. And here I was fixing to abandon space battle games in favor of oceanic combat. A bunch of cargo ships. these are done in 2.5D, so that the top/down view and the side/side view are monted in a intersecting planes. 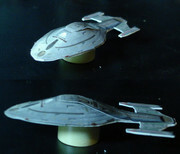 The federation one has a front/back view as well. I think I have figured out what you mean about the Federation cargo ship hackbarth, but any chance of a picture of the finished model? I'll take pictures, but these aren't printed yet. Anyone else made these ships? I would like to see pictures! Are these meant to printed on a 4"x6" ? The images are optimized to be printed with a photo printer on 10 x 15 cm photo paper which essentially is 4 x 6 inches.